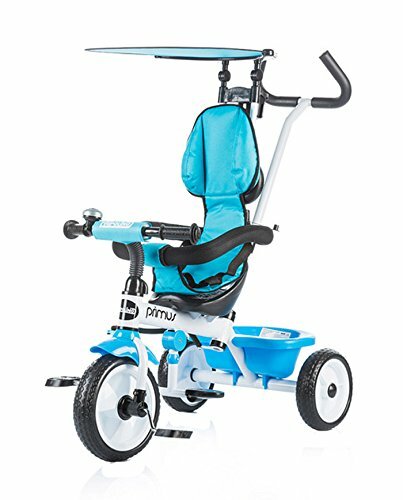 Your child will absolutely adore this primus tricycle with canopy from chipolino. this tricycle is suitable for children above 1.5 years, weighing no more than 25kg. equipped with an extra padded soft seat with harness, a safety bumper and an adjustable canopy. the parent handle is height adjustable for additional comfort. featuring a storage basket, a bell, a cup holder and a folding foot rest. this tricycle is made of 100% safe materials. we offer safe, comfortable and functional products distinguished by their unique design that make their use a pleasant experience for the families raising kids. our product range is constantly expanding with brand new concepts, as well as with reinvented traditional items. our team creates chipolino collections with care for our little clients ensuring their maximum comfort and entertainment. the safety of chipolino products is guaranteed and certified in laboratories and complies with all en standards.